A storage shower curtain, chic shower caddy, suction cup soap dish, and 29 other products to help you out when your messy shower starts looking like a scene from Psycho. 1. A bath mat to remind you which side of the bathroom you should always keep perfectly clean (hint: it's the part that cleans you). 2. A liquid dispenser so you can get rid of all the bulky bottles and visual clutter around your bath — making your shower especially chic. 3. A razor starter kit with a reusable handle and magnetic tile attachment that'll look as clean and smooth as the shave you get after using them. Get the starter kit from Billie for $9 (includes the razor handle, magnetic holder, and two 5-blade razor cartridges). 4. A set of bath tubes so your kiddos can play in the bath with toys that stick to the walls, letting you get rid of the ones that have been building up at the bottom of the bath. Get them from Walmart for $14.99. 5. 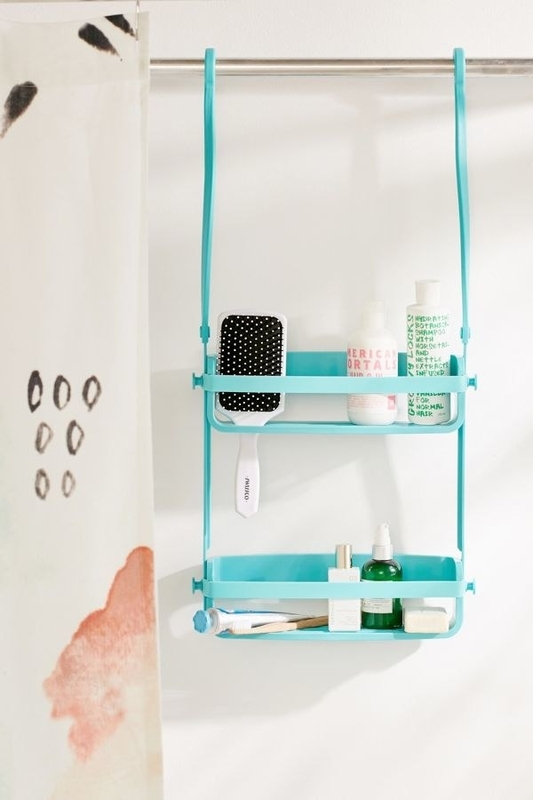 A shower caddy that's gonna EASILY keep everything you need within reach, while also keeping it from falling from the windowsill you've been shoving your stuff on. Get it from Amazon for $15.20+ (available in two colors). 6. 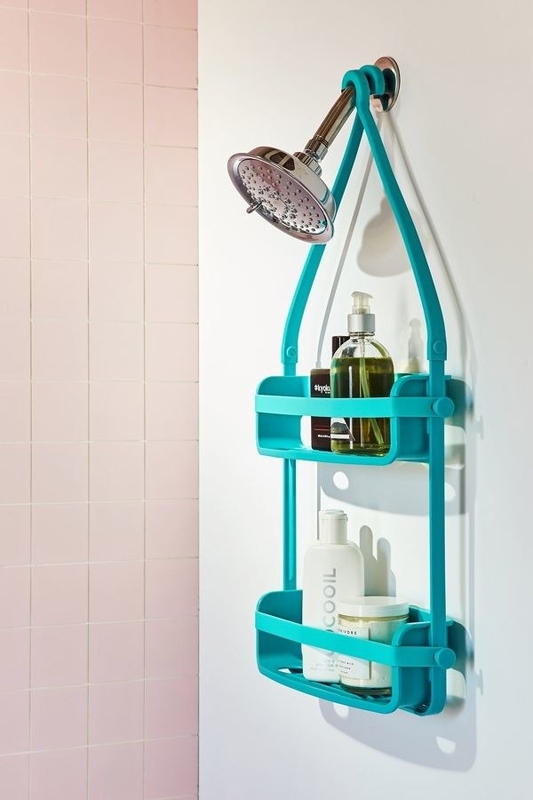 Or a flex shower caddy sure to add some color to your shower and fit anywhere you want. Get it from Urban Outfitters for $24 (available in two colors). 7. A bamboo scrub brush you can hang off the faucet or shower door, so you can scrub your shower clean as easily as you scrub yourself. Get it from Amazon for $5.53+ (available in three colors). 8. A TubShroom that's gonna get you out of some seriously ~hairy~ situations. If you're one of the two people who still haven't heard about this game changing hair catcher, check out our review! Promising review: "I have long, thick hair and a dog. We've had too many drain clogs to count, so when I saw this advertised, I thought it might be just the thing. 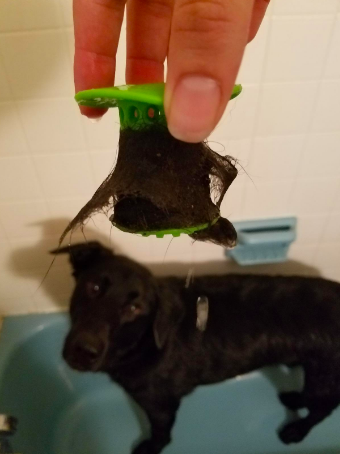 I used it today when I gave the dog a bath and holy cow! It caught the hair, allowed the water to drain, and cleanup was a cinch. This works exactly as advertised and I could not be more pleased." —123Hooray! 9. An iridescent shower curtain good-looking enough to use both as a liner and a curtain, making your shower a minimalist paradise. Get it from Urban Outfitters for $99 or get a similarly shimmery one from Amazon for $19.99. 10. 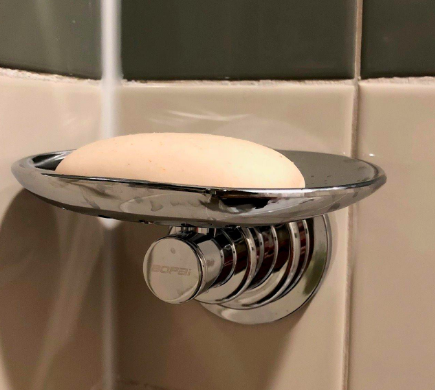 A sleek suction soap dish for anyone who wants their shower to look as sleek as they do when they get out of it. 11. 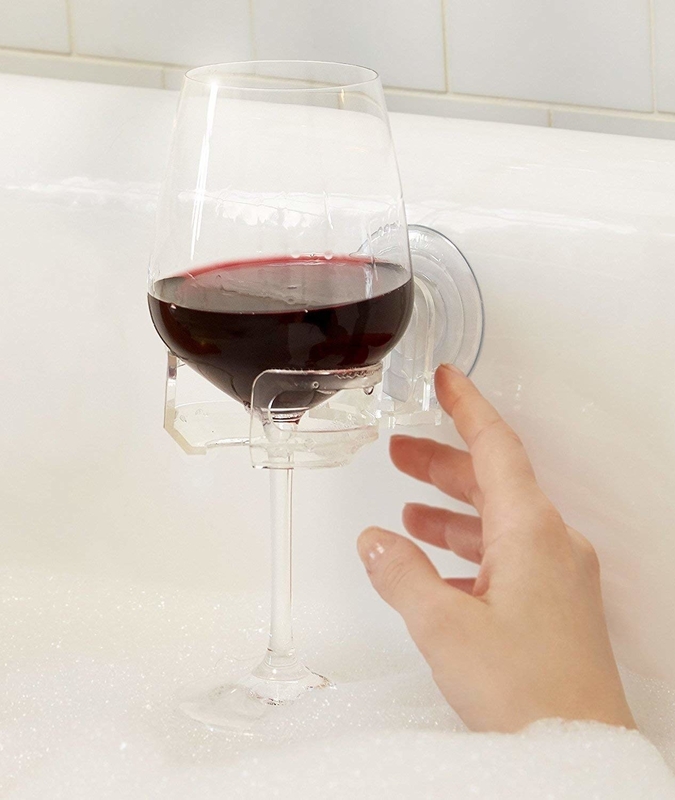 Or a multi-tasking soap dish that's gonna hold your fancy bar soaps and keep your loofa from looking aloof. 12. A soap, scum, and grime remover sure to keep your shower shining bright, no matter how much grit and grime you have to wash off at the end of a workday. 13. A window film that'll cover your shower window in something cute, instead of blocking out the sunlight with shampoo bottles to hide your body. This also works great to cover up your shower doors if you don't like the look but can't replace them altogether. Get it from Amazon for $9.49+ (available in two colors and four sizes). 14. A hair and body shampoo so you can ~raise the bar~ when it comes to your eco-friendly cleaning routine while also saving some space in your shower while you're at it. Get it from Free People for $19 (available in two aromas). 15. 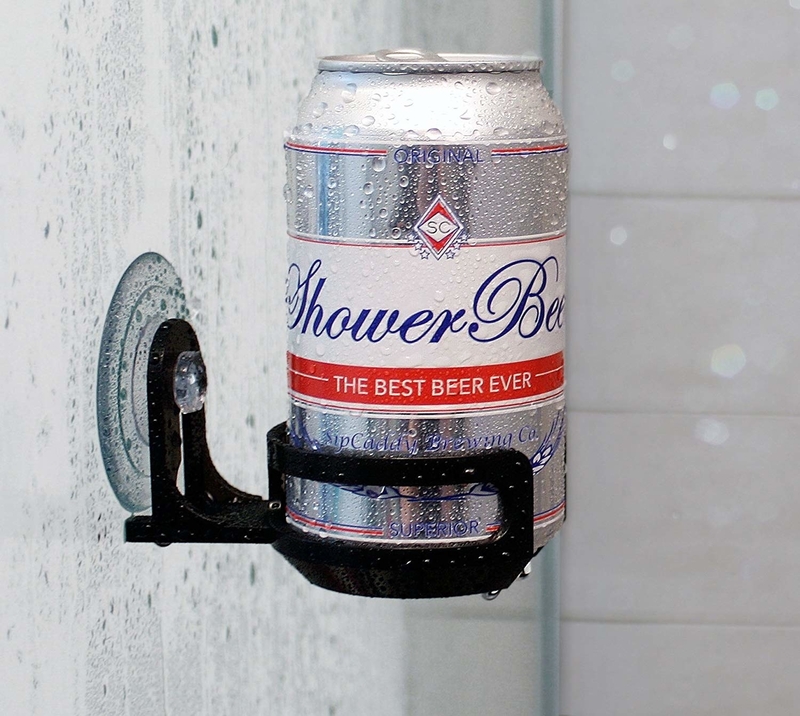 A shower cupholder for anyone who enjoys a nice shower beer, but would enjoy it more if it stopped slipping off the soap dish. Get it from Amazon for $13.95+ (available in six colors). 16. A flameless candle so you can create the necessary ambiance for a relaxing bath without the mess of a wax candle. Get it from The Home Depot for $8.98 or get a pack of six waterproof versions from Amazon for $23.98. 17. A ring cone so you'll stop leaving your rings to rust in the soap dish. Get it from Anthropologie for $19.20 (available in two colors). 18. A Soap on a Rope that'll wrap around your faucet and stay in its place — you're gonna look real ~slick~ with a cleaning tool this clever. 19. An octopus shower caddy for holding tentic-all of your stuff all in the same place. Get it from Amazon for $32.95+ (available in four colors). 20. Or a pocket curtain sure to help you ~clearly~ see where you've stored everything. Get it from Amazon for $11.84. 21. A swiveling, wall-mountable towel bar to hang as many as six rows of heavy-duty towels, so you can stop shoving all your towels on the handle of your sliding door. Get it from Amazon for $18.48+ (available in four colors and five sizes). 22. A pack of shower curtain holders to keep your curtain in place and prevent any water from making puddles outside of the shower. 23. A stunning storage bath caddy so you can keep your relaxation fixin's organized and in place, instead of toppling off the slippery, slender edge of the tub. Get it from Anthropologie for $148 (available in two colors). 24. A bath kneeler set with cushions for your knees and elbows and storage pockets to make your baby's bathtime a little easier and a lot more comfortable. Get it from Amazon for $24.95+ (available in two colors). 25. A spray gel so you can ~rust~ easy — this stuff will have your space sparkling in no time! 26. A silicone holder for people who do everythinggggg in the shower and need a space for all that special stuff. I'm not afraid to admit I brush my teeth in the shower. Not afraid at all. Get it from Amazon for $15.95 (available in two colors). 27. 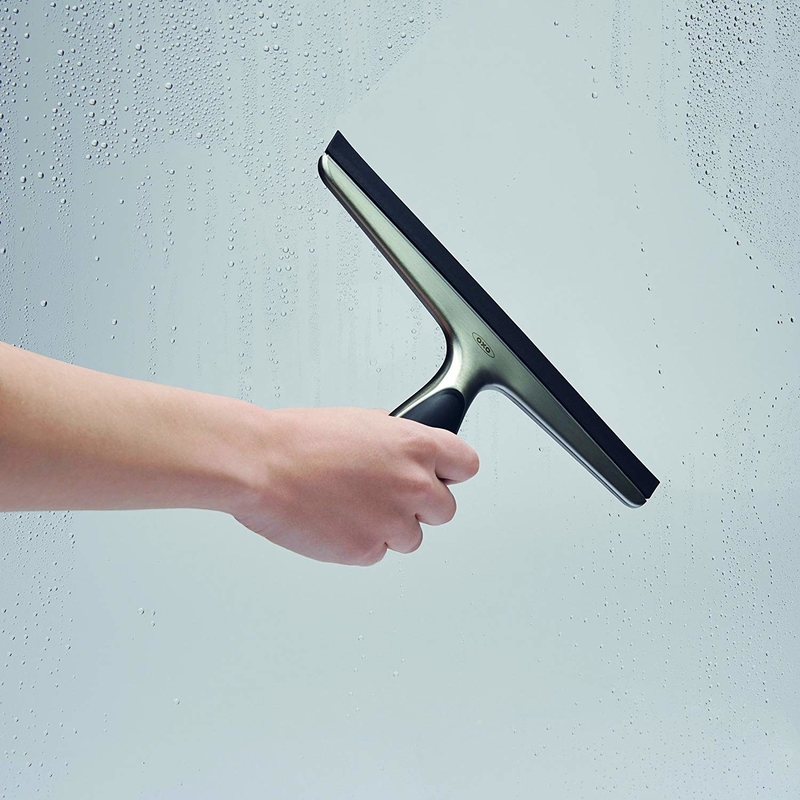 A Squeegee that'll attach to your shower door to remind you to quickly wipe away the water and avoid any grubby buildup on your glass. 28. A smart funnel that will help you get the last inch of shampoo from your old bottle into a new one. Because the number of nearly-empty bottles in your shower is starting to look like a trash collection... should probably stick to something like elephant figurines instead. 29. A toy storage bag so the mess of bath toys you manuever through in the shower stops driving you ~ducking~ bonkers. Get it from Walmart for $18.21. 30. A shower curtain for anyone who knows that (occasionally) it's just easier to cover the mess in a cute curtain and deal with that grout problem... later. Get it from Amazon for $17.91 (available in 35 styles and three sizes). 31. 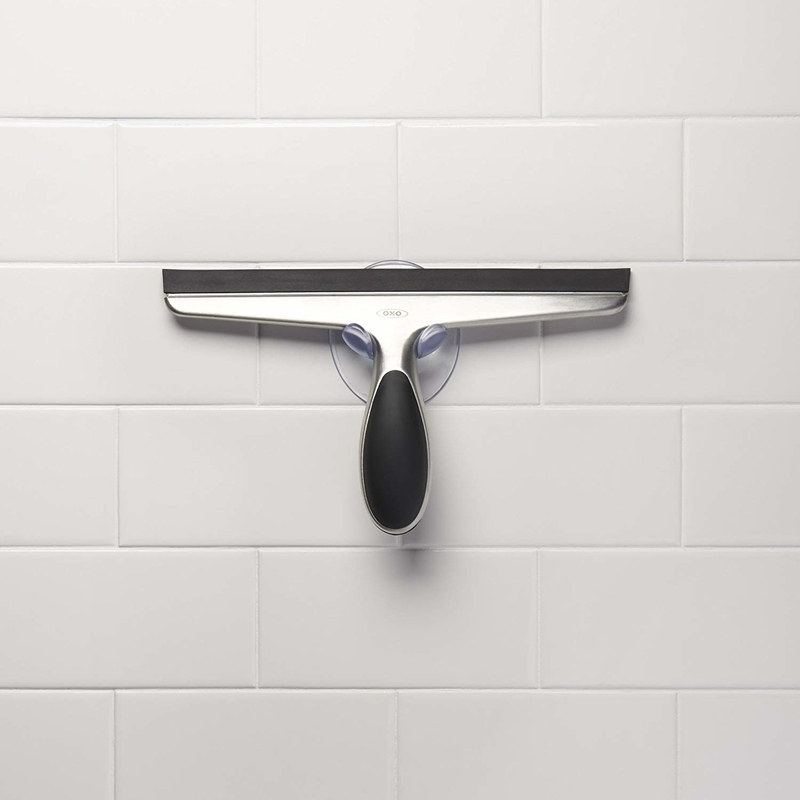 Or a grout-coating pen that'll make your grout look great when you finally decide it's time to toss back the curtain and do something about it. 32. And finally, a rainbow popsicle loofa that's gonna add a pop of color to your shower, because you deserve a real ~treat~ for keeping your shower looking so neat. Get it from Hot Topic for $4.74. 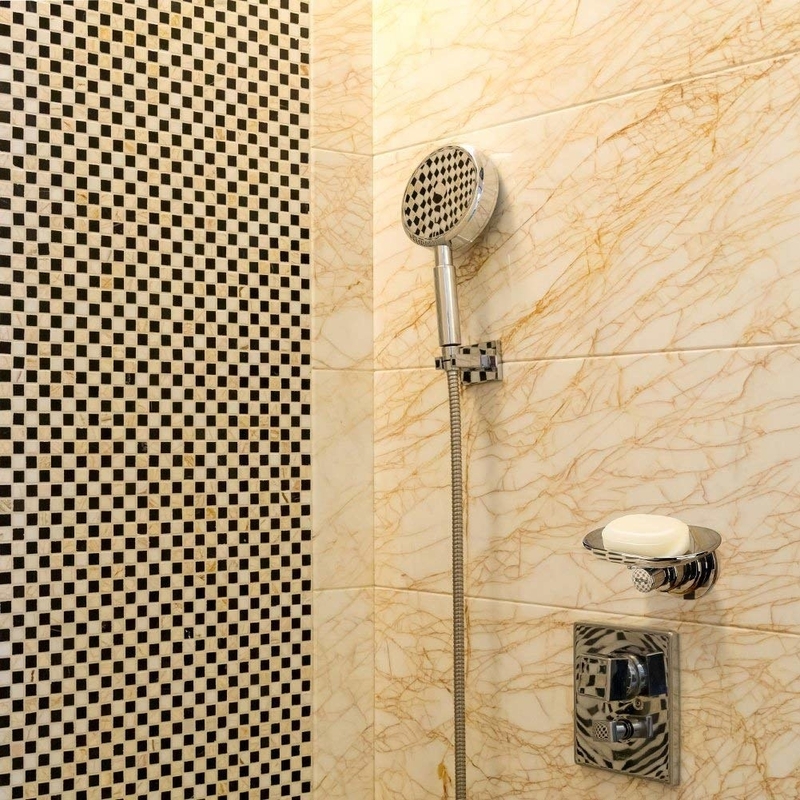 Fact: singing in the shower sounds better when your shower is clean as a whistle.